You know the older I get, the stranger my memory about my younger years gets. Now that I am in my late-40’s, much of my youth is in small bandwidth recollections. No feature length memories from my pre-teen years exist in my mind. And some of what I remember seems, well, sort of random. Take this one, for example. My mom had this totally beat up 1963 Dodge Dart. It was white and the paint was reduced to white powder due to her total wax negligence. It had a push button transmission, and no A/C (in Florida?). I remember being about 9 years old and having a friend over, when my dad asked me to get the keys out of the Dart. Apparently, my mother forgot them in the ignition. So I galloped out to the driveway with my buddy and did the only thing I had ever seen anyone do with keys….I turned them. The car started and my dad came blasting out of the back door and proceeded to beat my tail in front of my friends. Yes, he later apologized when he realized that it was an accident and not just me showing off for my friends. Another one? Every time my report card would come home, my dad would have to look over his glasses read my grades. Now that I am about the same age, my glasses don’t work either, so I know why he did that. I was a pretty good student, and a typical report card consisted of all “A”’s and a “B”. My dad would take off his glasses and, using the earpiece to point at the lone “B”, ask “What happened here?” He never mentioned the “A”’s, but he always pointed out the “B”. A while back, I did a pseudo- inventory of these mini-dramas that circle around in my brain, as I searched for a reason for them. Why not a Disney trip or fishing memory? Then it hit me! These totally disjointed moments from my past make up my “story”. We all have a “story”. It’s all of our past experiences, some of them monumental or even earth-shattering, which have formed how we think of ourselves. It’s really our own personal truth about us, and everything we do revolves around it. Let me unpack my two flashbacks, so you get what I mean. First, I am asked to get the keys and screw it up by starting the car. Message received? “David, you didn’t do that right”. Second, I get all “A”s and one “B”, and the “B” becomes the main topic of discussion. Message received? “David, you didn’t do that right”. And you know what? Even through adulthood, I have operated believing that same “story”. I can receive a thousand positive comments and one terrible review, and I will dwell on that one bad e-mail. I will pick myself apart, thinking “David, you didn’t do that right”. My personal “story” is “I can’t do anything right”. I know people who have been abandoned by their fathers at a very young age. When they get older, their marriages melt down and they end up divorced. After a couple of failed relationships, often through no fault of their own, they develop a “story” that essentially says, “I’m not worth sticking around for”. What’s worse is that people with this type of “story” end up fearing that someone will leave them, so they either stay very emotionally uncommitted, or they hold on so tightly that they suffocate the other person. And you know what happens? That person leaves them, which just further validates the “story” that “I’m not worth sticking around for”. It becomes self-fulfilling prophecy! Since we all have these background-based “stories”, which are really just a lie that we buy into, how do we change it? Simple. 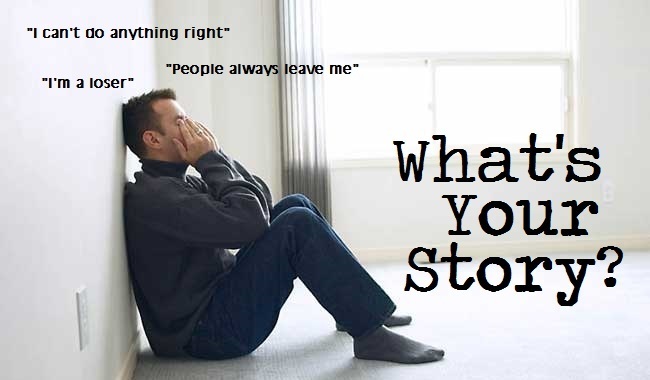 Replace our “story” with what God says about us. If your story is “Everybody leaves me”, remember that God says, “I will never leave you nor forsake you” (Deut. 31:6). By the way, “never” means never! If your story is “I’m not worth liking”, remember that God says you are “fearfully and wonderfully made”. (Ps.131:14). Quit telling God that He did a bad job assembling you! God doesn’t make junk. Don’t buy the lie of your past. God’s story is the true story about us. So what’s your story?